I know a lot of ladies love the look of Pocketfold Envelopes and like to try to use the budget friendly Vistaprint invites. 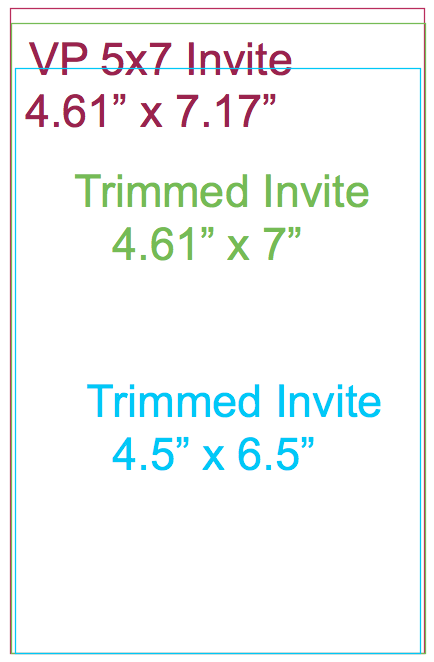 The only problem people run into is the weird vistaprint invite sizes. 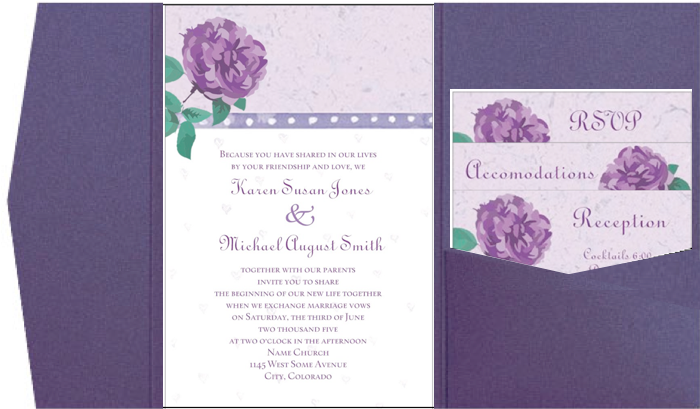 Here are a few tips to creating invites on Vistaprint that will fit your pocketfolds. 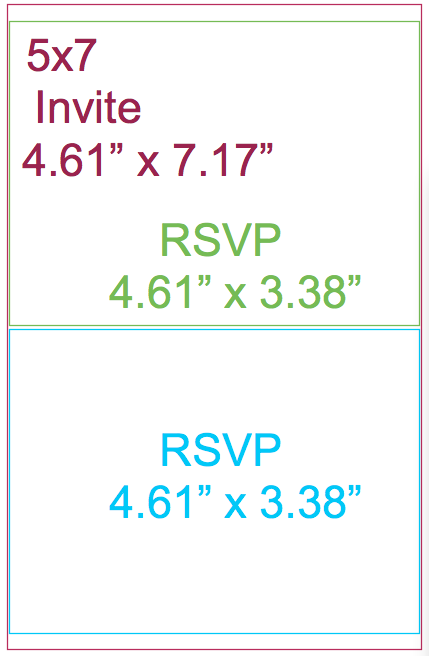 Some place on the envelope site will be a link that says “Sizing Guide.” You will need to know what they suggest for your invite size and what size your inserts must be to fit inside the pocket. Compare that to the VP document sizes so that you know what will fit or how much you will need to trim off. * a Vistaprint notecard/postcard will be TOO BIG for the pocket. A 5×7 invite cut in half will work for an rsvp with just a small trimming needed. A 4-Bar envelope will fit in the pocket. * a Vistaprint notecard and Vistaprint postcard WILL fit in the pocket as an insert as shown above, but the VistaPrint A-2 Envelope will be a “little” too big. I’m not sure if you can squish it in by folding the envelope flap over a little? Perhaps only use this design if you are doing on-line rsvp’s. * a Vistaprint notecard and Vistaprint postcard WILL fit in the pocket as an insert. The A-2 Envelope also falls within the dimensions and WILL fit. The A-2 Envelope also falls within the dimensions. * you will need to trim a little off the top to make it fit a 5×7 pocketfold. Trim a little more off the top and a touch off the sides if you wish to have an equal amount of envelope show around the invite when mounting it as suggested. * the A-2 corresponding envelope is just a hair too big for the A7 Himalaya pocket, perhaps it can be squished in? So, it is up to you if you wish to chance it and create your RSVP on the full notecard size if using this style pocketfold. 6×9 Invites Dimensions and Pocketfold suggestions to come! Please check for updates. Posted on September 30, 2013, in DIY Projects, Making Items on VP, Vistaprint ~ Tips and Tricks and tagged 5"x7" Invite, 5"x7" Pocketfolds, 5x7, Pocketfolds, Sizes, Vistaprint, Vistaprint sizes. Bookmark the permalink. 2 Comments. As always, you are an incredible help to the bride or groom to be. I hope all is well.